1. Where is Birger Hall and what are the Alumni Office hours? Birger Hall is across from the Vadalabene Center. Office hours are Monday-Friday, 8 a.m.-5 p.m.
2. 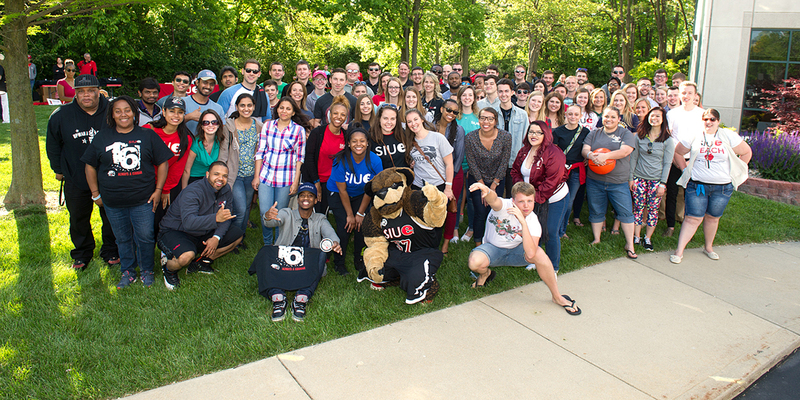 I am a graduate of SIUC; may I take advantage of the SIUE alumni benefits? We are unable to offer benefits to SIUC graduates because the SIUC and SIUE Alumni Associations are separate organizations with different missions. 3. Where can I park on campus? Free Parking is available for alumni in the designated parking spaces of the Birger Hall lot. If you are coming to campus between 8 a.m.-5 p.m. Monday-Friday, please stop at the reception desk for a day pass. A day pass is not required for these spots before 8 a.m. or after 5 p.m. Alumni who join the Student Fitness Center may purchase a brown fitness center parking hang tag by visiting the Student Fitness Center. Returning alumni may also pay to park in the Visitor’s lot. If you return to SIUE as a student or are an SIUE employee, you must purchase a University parking hangtag. 4. Is it possible to receive the Alestle? Yes, you can sign up to receive the Alestle via e-mail. Simply visit the Alestle website and fill out the form to receive the paper. 5. How can I contact a former classmate? The easiest way to contact a former classmate is to choose the “Find My Classmate” option on the alumni homepage, and fill out the form. This form is sent to the alumni staff who will contact your classmate on your behalf. If the alumni staff cannot identify your classmate, they may need to contact you for additional information. The alumni staff will send the requestor’s contact information to the classmate, allowing the classmate to contact the alumnus/a who requested the information. This helps ensure that the correct classmate has been found and protects the classmate’s privacy if the classmate chooses not to contact the requesting alumnus/a. Please note that our records do not include those who attended SIUE but did not graduate. 6. Can I get a permanent e-mail address? Permanent e-mail addresses are not available for alumni. 7. As an alumnus/a, may I use the computer labs on campus? The computer labs on campus are restricted to student use. 8. Is it possible to access CougarNet after I graduate? Enter your University ID / “800” number in the User ID box. Enter your University ID Pin. If you have forgotten your pin, select the "Forgot PIN?" option. Enter the answer to your security question, then choose "Submit Answer". Your PIN should now be reset and you will be able to login using that information. If you can’t remember the answer to the security question, please contact the Student Service Center at 618-650-2080. 9. How do I get a copy of my transcripts? Contact the Student Service Center at 618-650-2080 or visit its website to request official transcripts. Unofficial transcripts may be viewed through CougarNet (see the response to question 8). 10. How do I request a replacement/additional copy of my diploma? Complete the online form to request a replacement or additional copy of your diploma or contact the Records Staff at 618-650-2282 or 618-650-2263.